So original: Israel, the military aggressor, cunningly manipulating U.S. and EU security policies towards Iran – Western leaders who otherwise would have no national or regional interests in preventing Iran from developing nuclear weapons. The following comment has garnered 108 “Recommends” and hasn’t been deleted, despite the fact that it was posted over 11 hours ago. 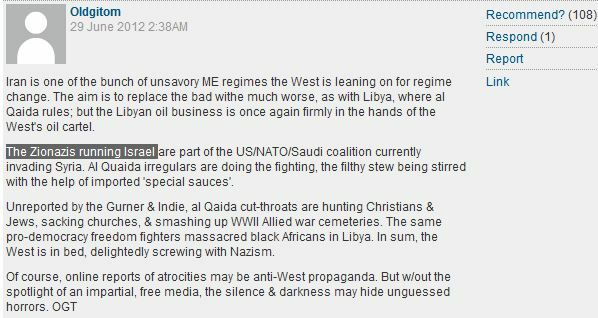 In fact, the same commenter used the term “ZioNazis” a mere two days ago, beneath the Guardian’s Middle East Live Blog, which similarly hasn’t been deleted by CiF moderators. It’s time to ask CiF’s comment editor Becky Gardiner if such an appalling and hateful epithet is consistent with their “community standards“. Alon Liel at ‘Comment is Free’: a match made in BDS heaven. Try posting a comment using the term Islamofascist, and Cif would ban you before your feet touched the ground. The Guardian is tolerating the anti-semitic language of the gutter. The mask has finally slipped, revealing the ugly foam-flecked brute behind the soft wet liberal facade. – Oldgitom clearly hates the Guardian. – Plenty of CiF comments using the term Islamofascist are allowed to stand. Feel silly? You should do. But of course, the usual chimps and chumps applaud! The Israel hate newspaper of Great Britain with its terror inciting hacks. It’s interesting that socialists/communists/marxists/greens/fascists and muslims all ascribe to their enemies the traits that they themselves most exhibit. Not sure that socialists in general should be included in what you say, except the likes of Shameless Milne of CiF, but I would call him an extremist. Extremists like him have in common the authoritarian personality traits which include rigidity of construing, hatred of the “other” and the faulty attributions which go with that, and their behaviour evidences paranoid splitting and projection. They think in extremely stereotyped ways about minorities, women, homosexuals, Jews etc, indeed about anyone who they believe thinks differently from them or is not like them. They are thus very dualistic- the world is conceived in terms of absolute right (their way) versus absolute wrong. All the groups you mention, with the caveat about socialists I have included above, also possess a lack of insight which makes the continuing of their behaviour possible. This takes place because they split off from their consciousness those bad aspects of their personalities which they are aware of and project them onto the “out” group (in Shameless’ case Jews/Israelis/Zionists) so that they can feel good about themselves and what they do. That applies to many groups I’ve seen, left and right. I might add one characteristic: they generally think that they are thinking for themselves, and anyone who disagrees with them is not. Oldgitom is not only a wacko – they’re also a critic of the Guardian. Has anyone posting here actually read the entire post? Missed the point again haven’t we Pretzel? Who cares how many screws Oldgitom is missing, the point is CiFilis allows his Israel=Nazis comments to stand. Try calling the Arabs “IslamoNazis” and then enjoy your moderation. They have now removed the two comments.